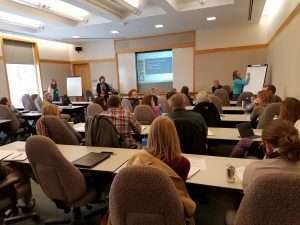 Every two years the Chesapeake Stormwater Network and the Alliance for the Chesapeake Bay with a generous grant from the National Fish and Wildlife Foundation host an annual Bay-wide Partner’s Stormwater Retreat. The retreat brings together over 100 federal, state, local, and NGO leaders from across the Chesapeake Bay watershed to share stormwater information, network together, and discuss collaborative implementation strategies. The final agenda for the 2017 Bay-wide Partner's Stormwater Retreat, a 3-day conference on Stormwater Management in the Chesapeake Bay that takes place in Shepherdstown, WV. The retreat also offers a chance to discover important lessons learned from NFWF stormwater grantees who have been implementing innovative stormwater demonstration projects across the watershed. 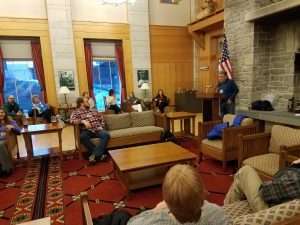 This year’s retreat featured a wide range of unique information sessions, focused on four tracks. 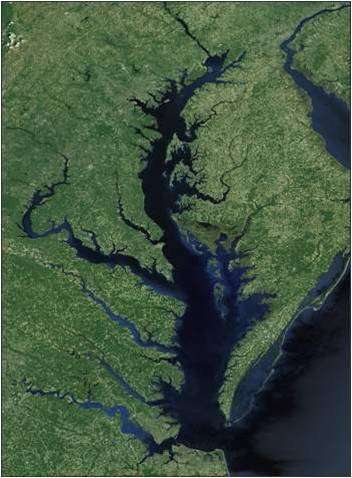 Track one focused on Stormwater and the Chesapeake Bay TMDL, with sessions dedicated to the implications of the Phase 3 Watershed Implementation Plans on both the regulated and unregulated communities. Track two, The Next Generation of Stormwater Practices, looked at some new and creative approaches to tackling the challenges of BMP implementation. The sessions explored opportunities in roadside ditch management, new techniques for treating highway runoff, and how stream restoration has evolved since the release of the first expert panel report several years ago. Compiled presentation slides from Track 1 of the 2017 Stormwater Retreat. Sessions included: Phase 3 Watershed Implementation Plans, NFWF Project Showcase, Stormwater Management in Unregulated Watershed Areas. Compiled presentations from Track 2 of the 2017 Stormwater Retreat. Sessions included: Improved Roadside Ditch Management, Innovations in Treating Highway Runoff, Stream Restoration Revisited. The two tracks on the final day of the retreat also discussed BMPs, but looked at their impacts beyond the TMDL. Sessions focused on the future of urban stormwater management, including some of the latest and greatest innovations in stormwater BMP design and delivery, as well as their many co-benefits, plus new tools for BMP inspection and maintenance. Compiled Presentations from Track 3 of the 2017 Stormwater Retreat. Sessions included: Beyond Nutrients: Environmental and Social Benefits of Stormwater BMPs; After the Flood: Quantity Matters in Ellicott City. Compiled presentations from Track 4 of the 2017 Stormwater Retreat. Sessions included: Stormwater BMP Design Innovations, New Tools for BMP Inspection and Maintenance, Next Generation of Residential Stewardship Practices, and Alternative Strategies to Deliver Urban Stormwater BMPs. Want to re-live the excitement of the retreat? Weren’t able to make it and want to experience it for the first time? Check out these downloads to see the retreat agenda as well as all of the powerpoint presentations that were used at the retreat. You can learn about almost everything the retreat attendees did without leaving the comfort of your own home!